In the 1995-1999 years, my wife Dawn and I would occasionally get away from Houston on weekends for a break from the consulting business we were building. We believe God knew exactly where He was taking us because even though I thought my farming days were done in 1991 when I left Wisconsin God clearly had something special planned for us. We purchased the ranch a couple years after first seeing it come on the market. I guess God was testing our patience too... And we're happy that He did. Our children were 4, 7 and 8 then and now they are 11, 13 and 14 and hopefully headed to Texas A&M soon. With the ranch being just 45 minutes from NW Houston and 20 minutes from College Station we are close enough, yet far enough away from the city. When we purchased the ranch, we decided to name it Third Day Ranch in honor of the day Jesus was Resurrected. We believed our role was to steward this special place and hopefully we can bring God glory in the process. We have held a Men's Retreat at the ranch with Christian author and writer Steve Farrar (www.stevefarrar.com) in the Fall of 2004. We had over 300 men attend that event and they came in from all across Texas. It was a pretty special way to use the ranch for things even greater than what we originally could see. Having grown up in the dairy business in Wisconsin I was taught the importance of genetics and forage. Today we are putting our emphasis on efficiency, growth and maternal traits. 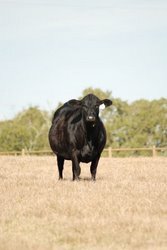 We aim to produce cattle with efficient frames who are capable of raising 650-800+ lb. weanlings. If that sounds far fetched, please give us a try. It is happening and it can happen in your program as well. As soon as we realized muscle and growth was possible we started aiming higher each year. Numbers are only part of the journey, relationships are the everlasting piece that we really seek. We hope to see our breed come together, work together and stay together. Brangus cattle offer something so unique to the beef industry, both in muscling and heartiness. It's a story worth sharing and there are plenty of facts to back up the cattle. We hope to be able to spend some time with you along the way as we all contribute as producers in the great business of beef and ranching.